Although I've been stupidly super busy, I have a few days off ahead of me and a determination to get around to reviewing my New Years Bead Resolutions for 2015, there are only two... how hard can it be? 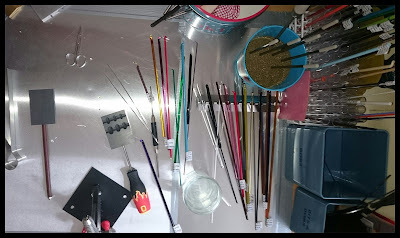 To book myself another Lampworking Lesson - At the start of this year it had been 18 months since my first (and only) lesson. I wasn't going to set myself any more than a "1 session resolution" as I wanted to see if I wanted to continue any further before committing myself. I also needed to check out if my shoulder would physically let my right arm be in a position to hold a glass rod. To spend less in 2015 than I did in 2014 - At the start of the year I wanted to reduce my jewellery spending in general. I knew my bus would take up a large proportion of my income, and I didn't set any complicated way of doing this other than it being less overall. I did a review in July at the mid-point and I was well on track with both resolutions - so what happened in the latter part of this year? 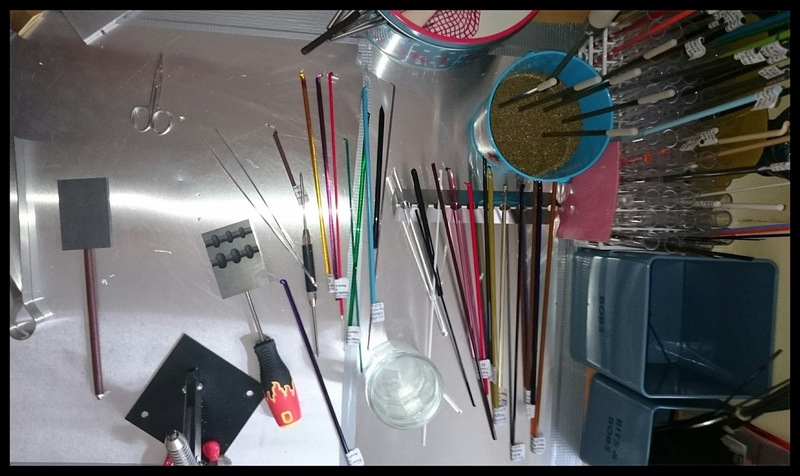 Considering it was as simple as booking myself another session I was well under way by July, I was renting bench space in a fab jewellery workshop and even had some of my own basic kit and glass stock. Six months later... and I have my own studio space set up at home, my own kit and even my own kiln. I guess I did like lampworking after all! 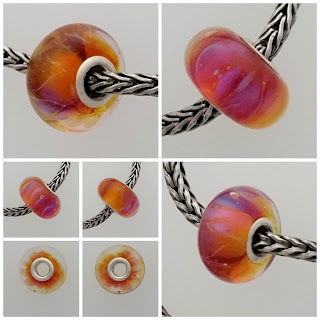 I could write an entire blog post on any aspect of my lampworking and in the New Year I will keep my promise and tell you all a bit more about it - each month I learn something new and there is another tale to tell! This month I have been busy learning how to core my beads with a one piece silver lining. This week I'm trying out my very first glass fuse... or "bad coaster project" as I have named it. As usual I've just jumped in; so I am expecting a coaster with very bad bubbles in; having read the appropriate chapter after I started firing it! My first slip was the gorgeous Elements Set from Alex Cramariuc, an absolutely beautiful set of heavy silvers that marked the start of my spending spree. Half of which I've not even told you all about yet. In fairness, I must point out that my Halloween splurge was actually diverted holiday funds after my mega virus, but it all still needed counting up for the final tally. So what's the plan for 2016? I don't really have one for now, I shall try and finish the year by not buying any more jewellery and spend more time on making some - that sounds like a good enough plan to follow for the next few days... I might just manage it! Did you set yourself any goals for this year? What happened? Will you plan for 2016? It's exciting to see how your lampworking goal worked out! It's awesome that you have your own studio now :) That bead you cored is beautiful! Oooh was that a light box? Have so much reading to catch up on but I keep filling my spare time... I treated myself to a new light thingy as my big tent was a pain in the backside for single beads! Thanks, that is my most favourite bead at the moment, it's the one I held my breath when I cored as I was so scared I was going to muck it up! The friend I did my bead making session with at the start of the year is here for a few days, arrived today, and we've just been going through where I've got to with my lampworking - he can't believe how far it's progressed since then, neither can I to be honest... even though I've been here for every step of the way! Will you do some more for 2016? I have two resolutions so far for the first half of 2016, but I thought that I had more so I'm just picking through the various places where I keep notes to see if I jotted another resolution or two down in the wrong place! Actually, I just remembered a third right now - not quite a resolution, but a goal none-the-less - so I guess that might just finish me up :D I'm sure that I do have more, but I also suspect that they could be second half goals if I remember them later. I like your second half goals, that seems to work really well! I've got more disorganised with my note keeping, but think that's because I've got too many projects on the go at the moment. Have been using December to stop beating myself up about having to neglect Curling Stones a bit and get some of my other projects to a more finished stage rather than working on everything a bit of a time at once. That seems to be working out so whilst *everything* is not finished, some things are a lot more finished and I feel less chaotic about it all! My bead goals for 2016 are to buy some more pink beads and to spend less money on beads. Obviously these goals contradict each other! I hope we can see more of the beads that you've been making in 2016! Happy New Year! I've already broken my no more jewellery until next year, with two gorgeous pink agates with unusual colouring... I do love pink beads, probably why I love the flashes of pinky purple in the bead on the page today! Will definitely be blogging a bit more about my experiences in lampworking and glassy adventures next year, that's probably as far as I've got with any new goals. My Crazy Life... All the B's!